While Americans honor all people who have served in the military on Veterans Day , November 11th, German speaking countries celebrate two different occasions on that particular day. 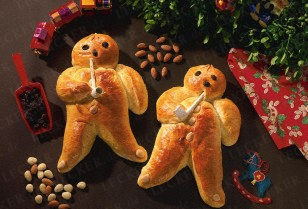 November 11th is Saint Martin‘s day which is being celebrated with lantern parades, St. Martin’s songs, special bon fires “Martinsfeuer”, and special baked goods like the “Weckmänner” . Children in particular are looking forward to this day since they get to walk their often hand-made lanterns in a parade together with children of the neighborhood while singing St. Martins songs like “Laterne, Laterne, Sonne, Mond und Sterne…” Most importantly this festivity indicates that the beloved, festive Christmas season is just around the corner! November 11th at 11am, indicates also the official date for the Carnival Season in Germany to begin. While you won’t see any carnival celebrations yet, the preparations for the season to come are now fully underway, like choosing the “Faschings-Prinzenpaar” , the Carnival royalties .